Matthew 13:44-46 “The kingdom of heaven is like a treasure hidden in the field, which a man found and hid again; and from joy over it he goes and sells all that he has and buys that field. 45 “Again, the kingdom of heaven is like a merchant in search of fine pearls, 46 who, on finding one pearl of great value, went and sold all that he had and bought it. Today's post features another look at Jesus' ongoing series of parables about the Kingdom of God in Matthew 13. When we speak of the Kingdom of God in the scriptures, two other truths are found associated with it in the Bible. The first of those is the Gospel itself, which is called by Matthew in Matthew 4:17 "the Gospel of the Kingdom". The Kingdom of God speaks of the power and authority of God expressed through the Divine King, Jesus Christ. Thus it only makes sense that King Jesus would have a message being heralded about His identity and achievement as Savior and Lord, namely the Gospel. Whatever we say about the Kingdom we necessarily say about the Gospel. The second truth associated with the Kingdom of God is the Christian life. The New Birth that manifests itself in saving faith by the word of God is how one enters into the Kingdom. (John 3:3; James 1:18; 1 Peter 1:23) Furthermore, living for Jesus is described as Kingdom living and often times has to do with the attitudes and actions of the follower of Jesus Christ. (see Romans 14:17). Again, whatever we say about the Kingdom tells an awful lot about how we view and live the Christian life. To put it plainly: if you and I are not prioritizing the Kingdom then such an attitude will come out in how we view the Gospel and the Christian life. These observations serve to show why Jesus' kingdom parables are so important. If you and I understand the nature of God's Kingdom, then we will necessarily understanding the importance of the Gospel and the significance of living for Jesus as His followers. Today's post will be looking at two short parables found in Matthew 13:44-46 - "The parable of the treasure" (13:44) and "The parable of the Pearl of Great Price" (13:45-46). The main point of today's post is: "Christians ought rejoice in the Kingdom of God". Lets now look at the two parables to flesh out what we mean by this point of application. Notice what we read in Matthew 13:45-46 “Again, the kingdom of heaven is like a merchant seeking fine pearls, 46 and upon finding one pearl of great value, he went and sold all that he had and bought it." The little word "again" tells us that Jesus is connecting each of these parables together like a string of pearls, adding layer upon layer and thought upon thought. In this little parable we see a man selling all that he had over having discovered a "pearl of great price". Whether on land or sea, Jesus' hearers would had identified with what Jesus was saying. The value of God's Kingdom is learned through see the hardships that come about through increased acquaintance with this fallen world. Whenever I read this short little parable, Moses comes immediately to mind, since he risked it all to follow after the Lord. Hebrews 11:24-29 records: "By faith Moses, when he had grown up, refused to be called the son of Pharaoh’s daughter, 25 choosing rather to endure ill-treatment with the people of God than to enjoy the passing pleasures of sin, 26 considering the reproach of Christ greater riches than the treasures of Egypt; for he was looking to the reward. 27 By faith he left Egypt, not fearing the wrath of the king; for he endured, as seeing Him who is unseen. 28 By faith he kept the Passover and the sprinkling of the blood, so that he who destroyed the firstborn would not touch them. 29 By faith they passed through the Red Sea as though they were passing through dry land; and the Egyptians, when they attempted it, were drowned." Moses had it all in his first 40 years of life, then lost it all in the next 40 years of his life and then had more than it all in the final 40 years of his life. Again when we talk about the kingdom, we can easily include the Gospel message and Christian life, since both are cut from the same Kingdom cloth. The Gospel establishes God's Kingdom reign in the hearts of men and the Christian life expresses God's kingdom reign before men. Are you and I willing to risk it all to live for Jesus and to know His Gospel in the scriptures? Have we reached the point, like Moses, where we find the Christian life and the scriptures to be so amazing that we don't need this world and its wares to thrill our souls? I read this past week a statement written by a pastor who noted that as he has gotten older, he has found himself preaching more on heaven. I too can vouch for that, being that in comparison to God's Kingdom, Christ, His Word and the Christian walk, this world pales in comparison. 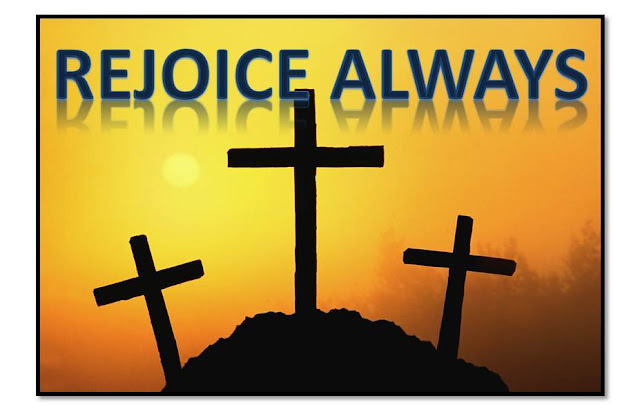 We ought to rejoice over the Kingdom of God because of the joy it brings and the value it has.